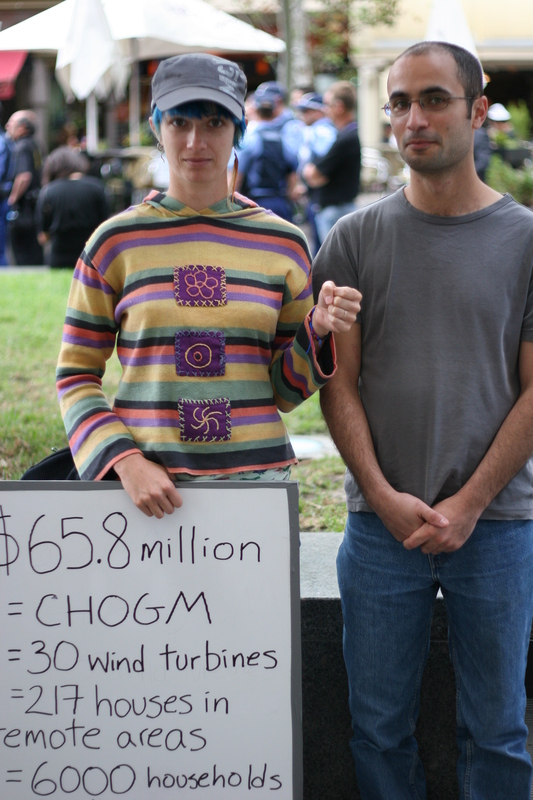 My friends Claire and Jason at the march against CHOGM before Occupy Perth. Occupy Perth has a place for silly facial expressions! 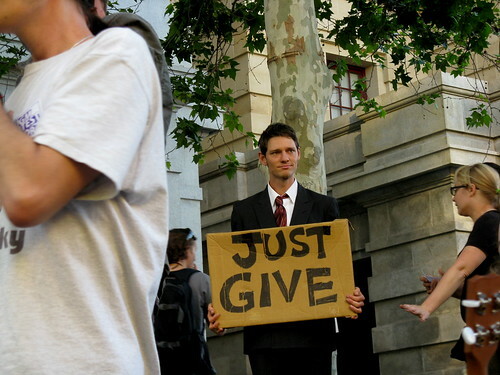 I went to Occupy Perth yesterday, along with quite a few friends. On the whole it was a good experience and the people who I talked to mostly felt positive about it. The message that’s mostly being used to frame Occupy events, ‘We are the 99%’, encourages participation: it’s open to interpretation and it’s broadly inclusive. The forms, as well as the messages, adopted for activism help to shape who feels comfortable participating. Signing a petition, for example, is a kind of activism that almost anyone can participate in: it doesn’t take much time, it doesn’t require too much thought, and it (mostly) won’t put you in danger. At the other end of the spectrum, activist tactics that require more time and are potentially dangerous (in terms of potentially getting hurt or arrested) are less likely to invite broad participation. More costly tactics (in terms of time and potential risks) are also likely to exclude some groups more than others, including those who can’t afford to miss time at work, those with carer’s responsibilities, ethnic groups which are already targeted by police, and people with disabilities*. I think that the Occupy format has a lot of potential to be inclusive. It’s costly (in terms of time and effort) to participate in some aspects of Occupy events: many people aren’t comfortable sleeping out, and consensus decision-making can be a painfully slow process if you don’t have time to spare. But having a continuous and visible presence in a central public space means that people can stop by whenever they have time and they can sit and talk and engage more deeply with the issues. At most of the Occupy events, people seem to be making an effort to invite participation, whether it’s through free yoga sessions, open classes, people’s kitchens, or simply by trying to build a positive and welcoming atmosphere. There were times yesterday when I feel like Occupy Perth wasn’t doing so well at this. At one stage, a group of people started putting up a small marquee as a symbolic action against the signs prohibiting camping. People were getting up and making quite fiery speeches about this, and when someone tried to argue against the action the megaphone was taken away from them. Those in favour of putting up the marquee somehow ended up with all the megaphones. My friends and I were quite uncomfortable with this: not just that some people seemed to want to carry out an action that specifically invited arrest, but also the tone of the speeches surrounding the action and (as far as we could tell) the lack of discussion that had preceded the action. This, to me, did not feel inclusive. It felt like it was shifting the tone of Occupy Perth to something more aggressive, where there was less space for negotiation than I had felt at the first general assembly. Finally, space was made to have some discussion about what was going on and allow people to speak for alternative actions. Even then, the tone felt uncomfortable to me: a few of the speakers in favour of putting up the marquee were starting chants rather than explaining why they thought the action made sense. People were surrounding the marquee and linking arms, standing in poses that indicated that they expected the police to move in at any minute. A few people who I spoke to later left at this point: they didn’t feel comfortable with what was going on, and didn’t feel like they were being represented. When a vote was taken about whether or not the marquee should go up, the majority of those present supported it – but numbers had dwindled, and I wonder how many of those who left did so because the event had taken on a more aggressive tone, skewing the vote. Photo courtesy of Flickr user sleepy chan. Communities that work can handle disagreement, and I feel like those involved in Occupy Perth dealt with the tensions that came up well. The police chose not to attempt to take down the marquee**. Occupy Perth’s police liaison negotiated an agreement that allowed people to stay overnight. My friends and I left for the afternoon, and when we came back in the evening we found a cheerful and welcoming atmosphere. We sat and shared food. My friend knitted and I crocheted and someone played ukulele in the background. We talked to each other and strangers about how Occupy Perth was going so far, going through what we wanted to get out of it, different ideas about activism. Being inclusive isn’t the only criterion that should be used in evaluating activist strategies. Non-violent direct action of the sort that only a few people are brave enough to engage in sometimes plays a vital role in creating change; signing petitions and letter-writing campaigns only work if there’s a clear target and desired outcome, and even then can often be ineffective. 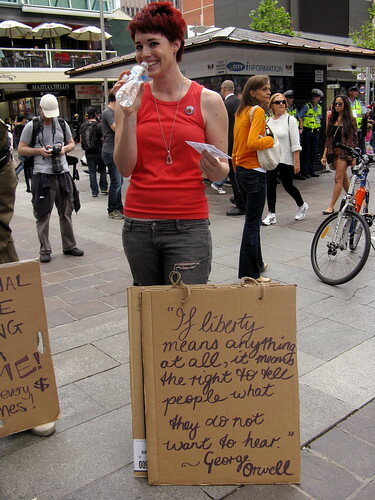 In the case of Occupy Perth, though, the decision to adopt the ‘we are the 99%’ message suggests to me that we should be trying for inclusive forms: we should be trying to create a tone and a space that invites participation from activists, from people who don’t usually go to protests, from passers-by. On the whole, I think Occupy Perth is managing that very well. * I’ve written more about this in the context of women’s involvement in the opposition to genetically modified crops here, if you’d like to read more. ** It is vital to remember that the police, and those in charge of directing the police, have a choice about how they respond. While I didn’t agree with the marquee being put up, acts of civil disobedience such as camping out absolutely do not justify police action like that seen in Melbourne or in other parts of the world. If non-violent protesters are dispersed by force, those held accountable should be the ones using the force, not the protesters.